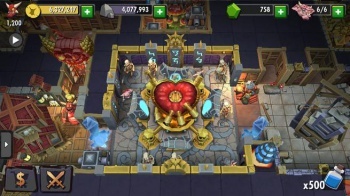 EA: Dungeon Keeper Failed by "Innovating Too Much"
People just weren't ready for the mobile game, according to EA exec. EA's free-to-play reboot of the classic Dungeon Keeper could have gone better, to say the least. It used the beloved franchise as a skinsuit for a sleazy cash grab. Not only was it panned, but it also sank its developer, Mythic. Six months later, the company is still dealing with the fallout. While EA CEO Andrew WIlson recently apologized for the whole thing, saying it was wrong, Frank Gibeau, EA's head of mobile, has gone the other direction and speculated that audiences just weren't ready for it yet. "Dungeon Keeper suffered from a few things," Gibeau told Games Industry. "I think we might have innovated too much or tried some different things that people just weren't ready for... I don't think we did a particularly good job marketing it or talking to fans about their expectations for what Dungeon Keeper was going to be or ultimately should be." While Dungeon Keeper ended up killing veteran developer Mythic, EA will still maintain the game because of its commitment to players. As Gibeau said, "[W]hen you bring in a group of people to Dungeon Keeper and you serve them, create a live service, a relationship and a connection, you just can't pull the rug out from under them. That's just not fair." It should be noted that EA can no longer legally market the game as free in Europe, due to its crazy amount of in-app purchases. At this point, it's likely best if EA just stops talking about Dungeon Keeper all together and moves on.